I was recently in Seville with my boyfriend and his family. Whilst browsing around the shops his mum told me she had been endlessly looking for a contour stick. I told her not to worry that the makeup blogger was here to help so I dragged her in to Sephora waiting for a world of possibilities yet, there was nothing. I didn’t give up hope in to KIKO we went! Nothing…After about 30 minutes of looking I had given up hope. Nowhere was selling cheap contour sticks! Of course we could of bought one in the shops we looked at but, they were all ridiculously priced and even when we found some normal priced ones, they only had the darkest colors left! It was January when we went hunting, so obviously stuff is going to fly off the shelves quicker but, even so it left me wondering where the heck are the cheap contour sticks?! Luckily, when I got home I went on a hunt to find the best online. The cheap contour dupes showed themselves in all of their glory to me so, even when on a budget we too can look like Kim K.
The Elf contour palette is super cheap. It’s not great for darker skin tones but, if you’re just looking for something cheap and does its job then Elf is your friend. 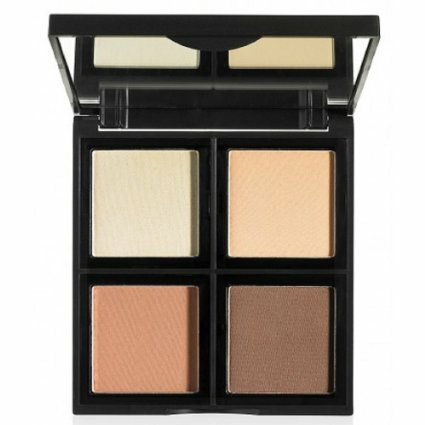 The top left hand color contains a slight shimmer which is great for contouring, highlighting, brightening and highlighting. It’s also Vegan which a lot of high end brands aren’t! I love their cosmetics and I even did a post on my favorites of theirs that you can read by clicking here. The reviews for this contour palette are beyond amazing. People are absolutely loving it and it’s easy to see why. It’s super cheap and finally a contour kit that comes in darker shades. It also comes with a highlighter that compliments the darker shade so well. We love you Sleek!!! Ok so it’s not the most attractive looking contour stick but, it sure as hell does its job. It’s on my top 5 because people are in awe of this wonderful little gem. For people who are and aren’t amazing at makeup it works for them and is also really easy to blend, something you should really look for with a contour cosmetic! I am a lover of things that do a million things in one and this palette is definitely one of them. It’s crazily cheap and it contours,highlights,helps cover redness and dark circles and it even is a normal concealer. It’s fantastic for newbies and even people who just love makeup and don’t need to spend a fortune. Finally, I am a huge fan of Barry M so when I saw his contour kit for under 10 dollars I was a little too excited to see what it was all about. It’s not a huge palette and it isn’t the best thing on the whole wide world but, it’s a cheap contour palette that works and provides us with an awesome bone structure, what more could I want? I hope you enjoyed my post on the Top 5 Cheap Contour Sticks if you did please let me know in the comments below and let me know your favorite contour palette!